Social Leadership is not simply another type of power that exists within a formal system: it’s a reputation led authority that exists outside the system. 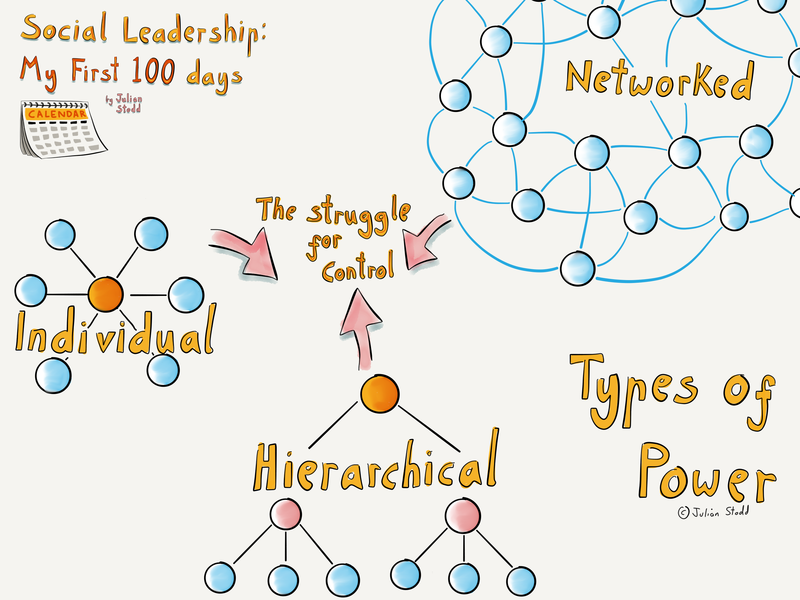 Whilst an organisation can give you a role, a position within a structural hierarchy, only your community can award you reputation, and grant you Social Authority within a community. But whilst different, the two types of power are not independent: to be truly effective, we need to understand the relationship between the two types of power, understand how they contrast, enhance, or diminish, each other, and understand how we gain one, and earn the other. Organisations are structures of power and control, even well meaning, brilliant ones: when you are recruited, promoted, or elevated, you are granted explicit, and implicit, forms of power, and gain an ability to apply certain types of consequence. 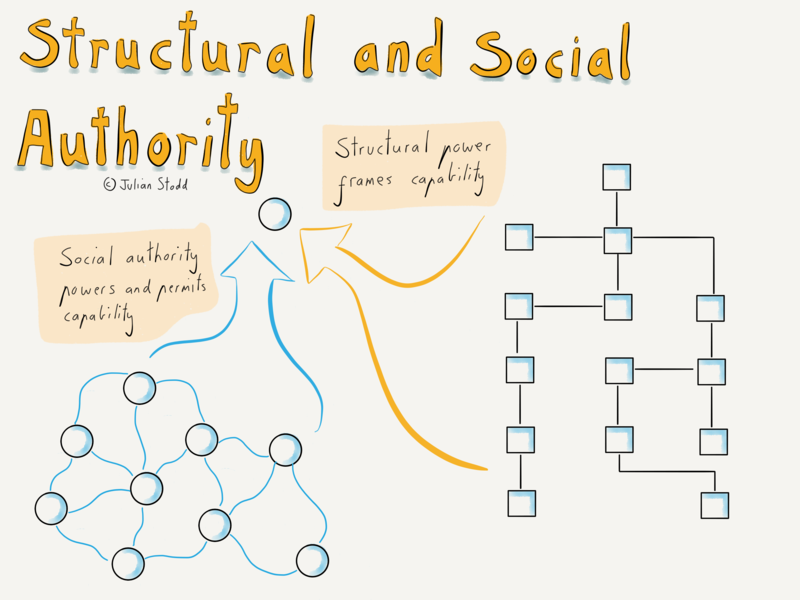 Social systems, tribes, and communities, are also structures of power and control, but utilising different types of power and consequence: formal systems apply structural, codified power and consequence, social systems, apply social and reputation based power and consequence, often based on membership, conformity, and exclusion. Both are powerful, but both are different. It’s possible to be awarded, and to hold, Social Authority, even when we have no formal power whatsoever, but in the context of Organisational Development, we are often working with leaders who have some level of formal power. The opportunity for them to become more effective therefore sits in their ability to understand, and develop, a capability in both: to understand the reach and effectiveness of their awarded formal power, and to build capacity in nurturing and utilising their Social Authority effectively. I’ve surveyed groups in various contexts, to explore just how much of the time they feel that they are effective using their formal, or their social, power alone. The results vary somewhat by sector, but typically leaders report that over 80% of the time, they are effective primarily through the application of ‘social’ power, through the consensus of their teams, communities, peers, and colleagues. It’s typically just a minority of the time that individuals feel that they are effective solely through the application of formal power, telling people to just do something, or suffer the consequences. But those figures may be disingenuous: the Social Authority that they wield is not abstract, it’s framed and contextualised by their formal authority. Formal power sets the context, but Social Authority enables us to draw upon different capabilities of the community. That’s why we need both: exceptional formal leadership, and leadership development opportunities, and exceptional Social Leadership, and opportunity to develop, rehearse, and refine that. All this happens against the backdrop of the Social Age: an ecosystem that sees a general erosion of the reach of formal power, and the extension, and expansion, of the Social. This entry was posted in Social Leadership and tagged Control, Leadership, Power, Social Leadership. Bookmark the permalink.